Are you interested in earning some extra money or long-term income? Avon Cosmetics Ltd is a World Leader in the direct selling of perfumes and cosmetics. AVON products are available in more than 100 countries around the world. The company offers you a great business opportunity by providing a broad range of quality beauty, fashion & gift products that you can sell with pride and confidence. The job of Avon Representative involves delivering and distributing Avon brochures to your customers. You manage and grow your own business, order goods on behalf of your customers, deliver and demonstrate samples and Avon products. You can earn some extra money even if you sell only to your friends and family, and buy your own products at great discounts up to 85%. You can create your own network of Sales Representatives and boost your earnings as Avon Sales Leader. Be your own boss and become a self-employed Independent Avon Representative or a Leader. You will receive free starter pack and brochures for your first two campaigns, and a welcome gift. Working for others, they decide your salary and working hours; when you run your Avon business there is no limit to your financial and personal success! The potential is determined by your dreams and effort. To earn extra money you can choose to work just few hours a week or increase the working time and your earnings by becoming an AVON Leader. Share the AVON Earning Opportunity with other people and support them in their road to success. You too can join the top leaders of AVON, who earn great money every month, have won cars and luxury holidays, and have enjoyed many recognition. With AVON, your dreams can become a reality. Collect orders, place online, deliver and collect payments….then, pay Avon and pay yourself! You will have access to the information, tools, sales, special offers, incentives and prizes on the Avon website. You can enjoy continued support from your leader. In order to join the Company, you need to be over 18 and live permanently in UK. You can place an order every campaign many times, but You do not have to place order for each brochure. However, if you miss 3 brochures in a row, AVON will sign you off automatically. (You can re-join, by completing process of registration from beginning). As you are self employed, your earnings are spoken of as Avon discount, not commission. – Discount in first campaign will be 20% starting from £1. – When you place a total order of £87 Avon will give you a 20% discount on your order, so you effectively keep 20%. – When your order is over £160 then your discount will be 25%. – There is inherited discount – what ever level of discount you reach in previous campaign you will start next. – Your regular order will be delivered within 3 – 5 working days. When you join AVON, you will have administration fee to pay, but don’t worry it will be split in 2 invoices. The fee is £16, first £10 will be add to your first invoice, rest of it – £6 will be add to your second invoice. AVON gives 100% guarantee on all products. All clients have 28 days to return or ask for replacement if the creams and perfumes are not used for more than 1/3 of the volume. Lingerie need to have all labels and original package. All depend on how hard will you work and what you want to achieve. You will start earning form orders over £87. 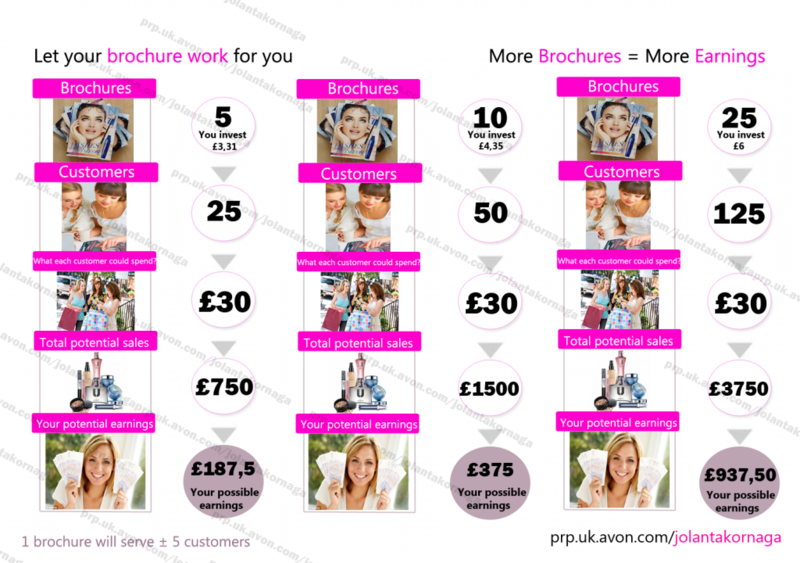 After that each pack will cost extra £0.50, so when you order more brochures you will pay less. If during all 18 brochures (1 year) you will make sales for more than £6700 you will automatically enter president club, which will give you even more benefits. Ask your leader for more details. After signing your agreement with AVON, you will receive your individual account number and you will be able to log in to your website and start benefit from it. Ask your leader to help you with registration, if you are not sure. Fast Track Representative line: 0333 234 5000 Fast-trak system available 24 hours, 7 days a week. Is a special extra brochure just for Representatives, where you can see product not available in the brochures. Order clearance products, samples and all marketing materials, like pens, bags etc. Avon will send you one free of charge with each order placed. You can also order loads off free products, please remember to add products number to the order, as AVON wouldn’t send them otherwise. How to get a new client? You can advertise everywhere you want, in newspapers, leaving your details in shops, beauty salons, schools, etc. You can also leave your brochures inside letters box (in order to use this method please speak to your leader about it) Make sure all your brochures or leaflets have your contact details, so clients can easily contact you. If you really happy with working for the company, you can always take your carrier higher and apply to work as a Sales Leader you will receive all training and help that is needed. Remember by joining my group you can always count on me, if you not sure about anything just ask and I will do all I can to help. Also when joining you will receive free starter pack, where you can find all you need to place your first order. WITH AVON, YOU SET YOUR OWN GOALS. WE ARE HELPING YOU ACHIVE THEM.